My First Podcast! Thank you, Dan Blank! Celebrating my fiftieth school visit in October was a milestone that made me want to do cartwheels (if I still can?). I wrote a fun blog about it that you can READ HERE, and it was an amazing feeling to treat the school, Ridgemont Elementary of Houston, to a number of surprises that I had up my sleeve. One surprise that I did not plan for or expect to receive was a PODCAST! After I posted a photo of myself holding two large gold FIVE-O balloons on Instagram, I almost immediately received a text from Dan Blank. 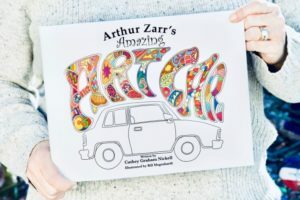 He said he was fascinated that although my children’s book, Arthur Zarr’s Amazing Art Car, came out awhile ago (in 2016), he was impressed that I’d done such a good job of making it relevant. Of showing up. Of forging meaningful connections around it. WOW! That made my day! Dan then asked what I had learned along the way and what value I had realized from it. We chatted, and he said he’d like to feature me on his podcast. Let me rewind a bit to tell you who Dan is, in case you don’t know. Dan Blank is the founder of WE GROW MEDIA, and he helps writers and creative professionals share their stories and connect with their audience. He has collaborated with thousands of people via consulting, workshops, and courses. Additionally, he’s worked with amazing organizations such as Penguin Random House, Hachette Book Group, Sesame Workshop, Workman Publishing, J. Walter Thompson, Abrams Books, Writers House, The Kenyon Review, Writer’s Digest, Library Journal, and many others. Dan also facilitates the Creative Shift Mastermind, which I was fortunate enough to participate in twice. When you sign up for his Mastermind course, you join Dan and approximately ten other writers to find more time to create, hone your creative process, reach readers, and get accountability. The next session begins January 1, 2019, and you can sign up for it HERE! 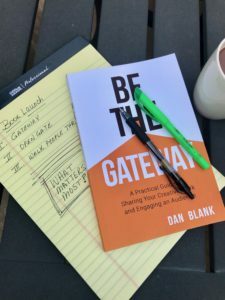 Pick up your own copy of BE THE GATEWAY by Dan Blank. I loved this book! I talk about this very thing in Dan’s podcast. About how when I got the idea to write Arthur Zarr’s Amazing Art Car, it was a dream that grabbed me. A creative passion that I didn’t let go of—not for a minute—until I was holding the beautiful book in my hands. And since art often imitates life (or maybe, according to Oscar Wilde, it’s the other way around), my fictional character, Arthur Zarr, did the same thing. He didn’t know he was going to build an art car that day when he first glued an acorn to the front of his vehicle. It was just a snippet of an idea. An idea as small as the very acorn itself. But that idea grew and grew into an amazing art car, and as a result, Arthur made friends and found his community—his tribe—along the way. Here’s a quick link to buy ARTHUR ZARR’S AMAZING ART CAR. My children’s picture book was released in 2016 and is still thriving! And like my imaginary Arthur Zarr, I’ve found my tribe, too. Amazing friends I met through Dan’s Creative Shift Mastermind—Teri Case, Lisa Sinicki, Amanda Toler Woodward, Rupert Davies-Cooke, and Brian Joyner. People I met online or in person through various writing groups—Ellen Leventhal, Noelle Shawa, Rachel Kosoy, Ellen Rothberg, Lynn Abrams, Allison Zapata, and Shelley Kinder. Those I met in the trenches of book creation—Bill Megenhardt, Emily Calimlim, Paige Duke, Sheri Jacobs, Scott Sinnet, and Mackie Bushong. The many teachers and librarians who have supported me by inviting me to speak at their schools. Old friends I’ve known for years who share my passion for books and writing—Laura Holman-Byrne, Mary Ann Van Osdell, Pat and John Graham (Hi, Mom & Dad! ), and so many others. And of course, I can’t forget ALL my fantastic new art car friends! What are you passionate about? What creative push are you focused on today? Whatever it is … Be Amazing!